The Phantom 4 will attempt to avoid obstacles on its RTH path if the OA system is turned on. However, the best course of action is to set your RTH altitude high enough to avoid any trees, buildings, power lines or other obstructions in your flying area. NOTE: Check and adjust these settings only when the Aircraft is powered on and connected to the Remote and DJI App. Check them before every flight as they may change with a battery change, firmware updates, etc. Note: Due to the OA (Obstacle Avoidance – Computer Vision) system included, the Phantom 4 has additional flight modes and capabilities. You can read about them and see a video demo in our article here. Intelligent Flight Modes are accessed in various methods depending on the exact model. Please consult your manual and the DJI Go App for the exact setup of your model. GPS (P) – (Positioning) mode attempts to use as many of the Phantoms sensors to keep the aircraft stable. The P system will use GPS as well as the Barometer (altitude) and, if closer to the ground, the VPS sonar and camera ground sensors (P3S has no VPS). ATTI (A) – is a mode available on all Phantoms. This turns off the GPS system but maintains altitude (barometer). In this mode the Phantom will drift with the wind and so must be actively piloted. One use of ATTI is for the pilot to regain manual control if he or she suspects the GPS system has gone awry. FUNCTION (F) are set by the 3 position with in the upper left of the Phantom 3 and activates other intelligent modes. Most flights will be in P mode which will keep the aircraft as stable as possible. The additional modes can be used once the operator has familiarized themselves with the pros and cons of these options. As an example if a GPS error occurs and the Phantom starts flying away or acting erratically, an experienced pilot will switch into ATTI mode and regain control. Note: The mode switch does not change modes in the stock (default) setup of the DJI Go App – you must first choose Multiple Flight Modes in the MC Setting -> Advanced Settings menu screen. Note: Check your manual to confirm how to enter these modes on your particular model. Point of Interest is an advanced feature which allows you to select an object (example – a church steeple) and have the Phantom 3 circle the object while keeping the camera pointed toward it. Follow Me – allows the Phantom to follow a target – for instance you on your bike, at a set distance and height. You must have a GPS enabled device (iphone, etc.) running the DJI Go App for this to work. Note that this should only be used in large open (and treeless) areas due to the lack of accuracy of GPS positioning. The Phantom 4 has a more advanced follow which uses the built-in computer vision. Waypoint Flying – These terms describe the ability of a Phantom to fly a preset course. You can set a course by flying it once and then saving it. The built-in waypoint program has some limits in terms of range and capabilities however it should be fine for most common uses. See the following section on Litchi and other 3rd party apps for more advanced waypoint and autonomous flying hints. Home Lock should be thought of as a way to save your quadcopter when it’s fairly far away and you have lost orientation. In these cases, you may become unsure of which way your right stick movements are sending your Phantom – so you may be flying it even further away when your intention is to bring it back. When you switch to Home Lock, your Transmitter will operate just as if you were standing behind your quadcopter with it facing away from you! If you pull back on the right stick, it will fly directly back toward you, no matter which way it may have been facing. It can undoubtedly save your Phantom without you having to fall back on Return to Home (RTH) or other measures. 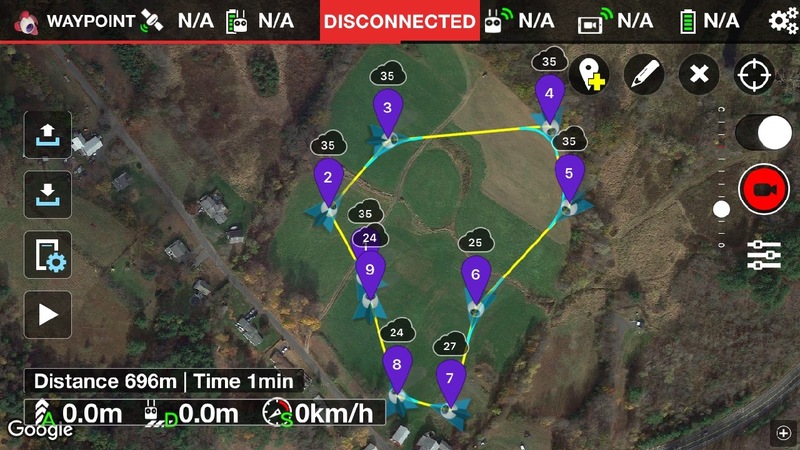 Course Lock allows your Phantom to fly along a straight path while allowing you to still rotate the aircraft and camera. As an example, you could use Course mode on the football field sideline and set it such that forward moves the aircraft along the length of the football field. But as you fly the aircraft down the field, you can pivot the aircraft and camera to the subject you are recording. Think of it as a cable-cam or camera on rails. Keep in mind that these modes of flight requires some experience and a good understanding of maps, distances, altitudes and compass directions. It’s probably wise to become very familiar with your Phantom before trying the Intelligent Flight Modes. Experiment in a large open area and become familiar with the instructions on how to terminate autonomous flight. This way, if things go wrong, you can regain control or possession of your valuable quadcopter. You can also use the built-in flight simulator to practice these advanced flight modes – this will definitely help with your preparedness once you are ready to deploy them in the field. The Phantoms are not limited to the features which DJI provides. They have released an SDK (Solutions or Software Development Kit) which allows for 3rd party access to many of the instruments and capabilities inside this machine. One example is Litchi (see our introductory article) which allows you to plan waypoint missions perfectly – even before you head out to the flying grounds. Another popular app is Autopilot – which features various flight modes including the ability to photography a panorama. Mapping is available for your Phantom including the popular Dronedeploy application. These three apps are just a sample of what is available to extend the capabilities of the Phantom. The use of these apps allows the Phantom to be used in various agricultural, construction and inspection pursuits. The vast majority of Phantom problems can be solved by patience and asking your fellow pilots on one of the many internet forums or social media groups that cover the Phantom. Often the solutions involve reinstalling of software and firmware, rebooting of the Phantom and/or the smart devices. In some cases, the use of a newly formatted SD card will allow for reinstallation of the firmware – and solve some nagging problems. If all else has failed and you suspect an actual factory hardware defect, you should contact either DJI or your dealer. The Phantoms have proven a very reliable machine so these occurrences are quite rare. In terms of customer support, you will get good answers and helpful advice from many of the R/C forums around the net. DJI has some employees who frequent these forums and help with some support. DJI even maintains their own forums on DJI.com – so you can check for answers on the corporate site. Although the Phantom quadcopters are reliable, sooner or later many owners are going to need repair services. In most cases, this is due to operator error such as hard landings, collisions with trees and buildings and landing in water. Very simple repairs and replacements can be DIY (do it yourself) – examples including propeller and landing gear replacement. Other systems, such as the Camera/Gimbal assembly, can be replaced with a new part. Be aware that the camera and gimbal alone cost about 1/2 the total price of a Phantom. DJI and/or 3rd parties will also do repairs on your machine outside of warranty. Two well known repair shops are Neary Aerial and USDronerepair. The best way to keep costs down is to avoid crashing your Phantom. Fly conservatively and use your common sense to plan your missions, set home points and keep your equipment clean and functional.